Last week I visited my second cousin once removed. She is in her 80s with no heirs and seems to be in failing health. She has been passing on to me pictures of my family; but today she gave me something very special. She said that it is a butter churn that was used by her great grandmother, who is also my second great-grandmother. I was blown away by her generosity. The beautiful old churn has a stoneware base, and the wooden parts are worn smooth from much use. My great great grandmother was born in 1839 and lived to be 95 years old. So I brought the churn home and noticed on it a stamp that said Earnest and Cowles, and I googled the name. Here is what I found. The base of the churn was made in Baltimore sometime between 1828 and 1852, the years in which the manufacturer was in business. Since my 2nd great grandmother was only 13 years old when the company went out of business, I’m fairly certain the churn originally belonged to her mother. There is a history to the manufacturer and others like it in Baltimore. Baltimore was an important port city when the War of 1812 began and when the British blockaded America’s ports. All of a sudden supplies from Europe including stoneware like this churn ceased to be obtainable; and Baltimore’s port-based economy suffered, too. What grew out of this were several new businesses to manufacture the needed supplies. Several different shops sprung up to manufacture stoneware in Baltimore over the next decades. Baltimore became known for its stoneware. Her mother, my 3rd great grandmother was a Wheeler born in another port city miles below Baltimore, called Wilmington, NC. She married there in 1836, and soon after the family migrated to southwest of Charlotte. 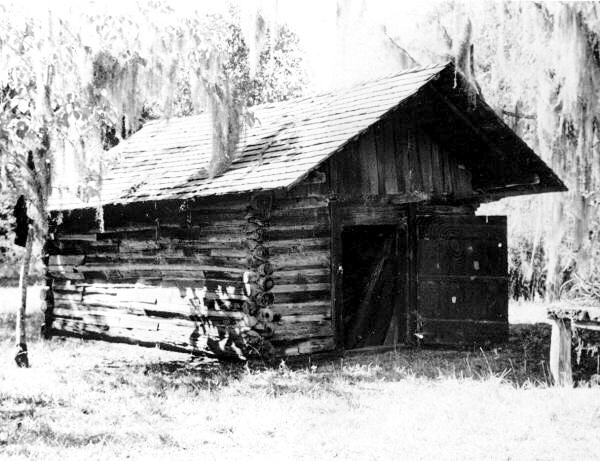 About 1844, again she and her husband and five of their children migrated, but this time farther south to Florida with a sixth child born in Georgia on their way down. I’m almost positive this churn made both of those long trips down from North Carolina to Monticello, Florida where they settled for good. The churn was inherited by her daughter, my 2nd great grandmother; and it was then passed on down two more times before reaching me, always through a female family member. I asked my cousin why she chose to give the churn to me. She said that she believed the churn should always be passed along to another daughter or granddaughter like herself. 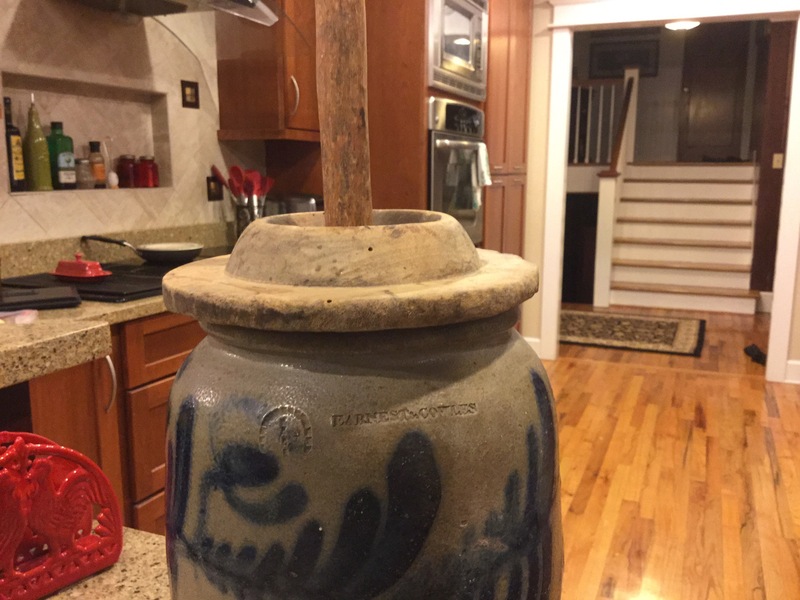 So for the past week I’ve been unable to stop glancing at the churn, which sits in my kitchen next to an old ten gallon demijohn which came down from my North Georgia relatives through my father. I can’t help thinking about Mary Wheeler, as a young bride in Wilmington and wondering if the churn might have been a wedding gift. And if it was, who gave it to them, to Mary and her groom. I ponder how it might have been carefully tucked away for the hundreds of wagon miles they traveled–the streams and rivers it crossed as they made their way west across North Carolina and then years later when they decided to move on down south, through South Carolina and through the plains of Georgia. On its way to Florida Mary was pregnant. In 1844 this child was born somewhere on the trail or a road in Georgia. A later census simply reads that he was born in Georgia. I can only marvel at Mary’s fortitude, her resilience. Did they stop long enough for her not only to have the baby but to also heal? Was it sweltering hot or was it a comfortable spring day? Did she have help from her two oldest children, both daughters, ages 7 and 5? Did they take over the butter making chore? Did she suffer from anything like post partum depression or homesickness? Or did she have time for such? Did she miss her own mother? After all, she was still only 23 years old. And then again my mind wandered back to the utility of the churn’s purpose. How many churns of butter did it make before it was retired due to more efficient technology? How many hands labored on its dasher? 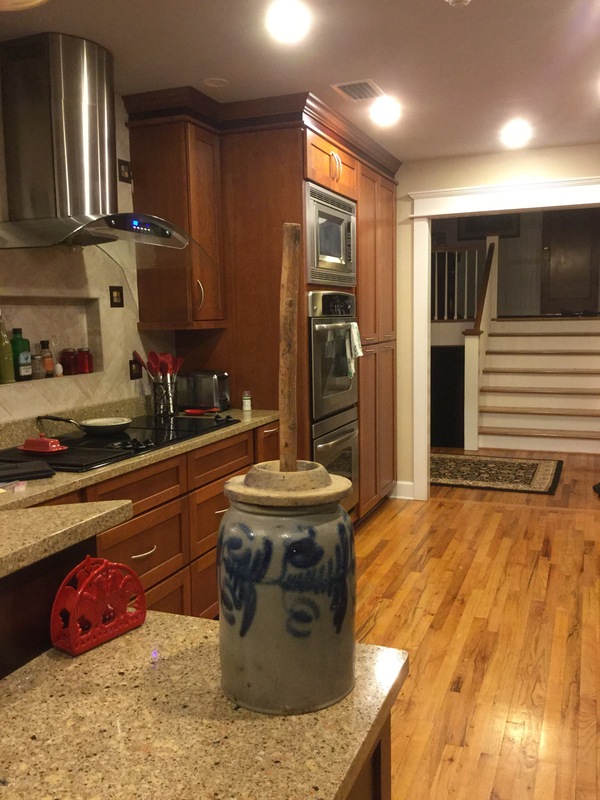 There was a moment late that night on the first night I placed the churn in my kitchen. I was too excited to sleep. I was alone but felt very much surrounded by loving spirits. In my heart I promised to take special care of this precious gift that was entrusted into my safekeeping. And I am very humbled by its surmised story and by the cousin who thought that I was worthy of the task. British Isle Ancestry? Take a look at these maps. I ran across some very interesting information today. My Roe ancestry, using my uncle’s YDNA test results and a surname YDNA project, shows close matches to people in Ireland, Scotland, and Norway. So, of course, we are interested in information about the British Isles. The United Kingdom’s “The Independent” published two maps showing the genetic makeup of Britain. It shows 17 DNA clusters that reflect key migrations and separations in early history. The maps are based DNA samples. The results of the popularity of these DNA tests, mostly due to their being more affordable, are really beginning to provide answers about the migrations of mankind. 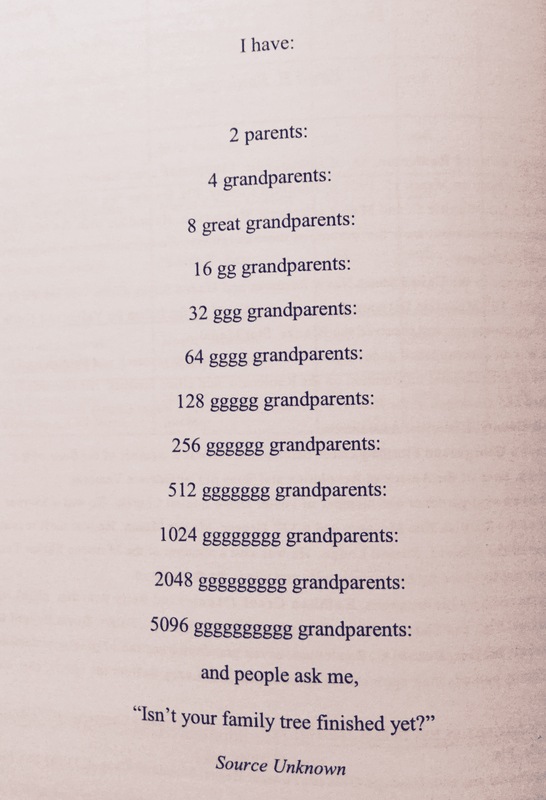 So Why Is A Family Tree Search A Lifetime Project? Day before yesterday I went in search of another ancestor. This one is my great-great grandmother Emma Leana Scott who married William Thomas Boland the son of John Wesley Boland. John Wesley’s grave, if you’ll remember, was the first one we searched for on our way north to the conference. It was located on the military base at Fort Benning, Georgia. Emma Leana was John Wesley’s daughter-in-law. She was my grandmother Annis Wilkerson Hamrick’s grandmother, who Annis never knew because Emma Leana died almost 19 years before Grandma was born. Emma Leana was born in Georgia just before the Civil War in 1856. She married William Thomas in 1872 at the age of 16, and she died March 1, 1891 at the age of 35 after giving birth to ten children. 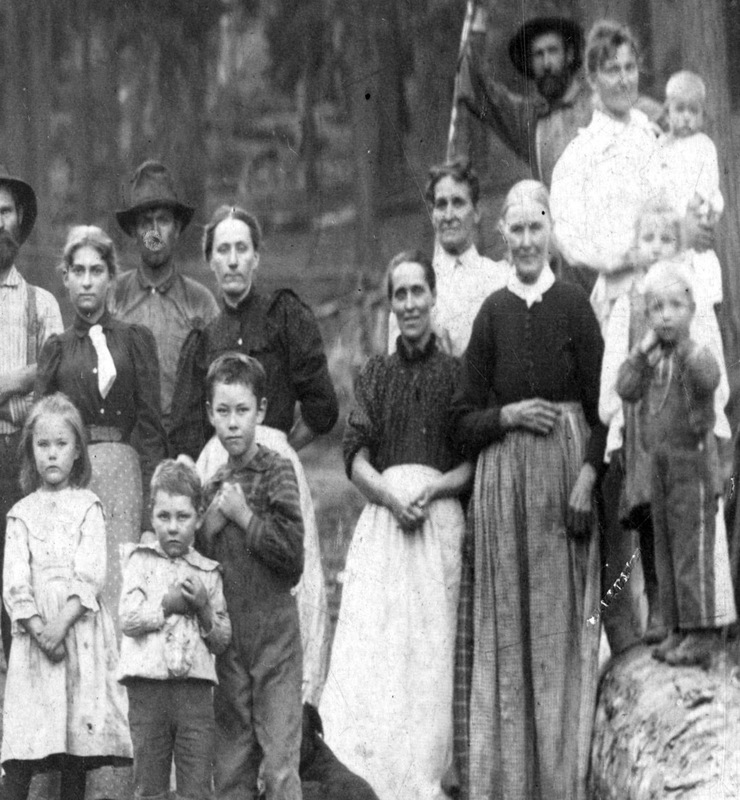 In the 1880 census the family is shown as living in Muskogee County near Columbus. Using the census records, I believe it was in the vicinity of the Midway Methodist Church where her father-in-law John Wesley had been a minister. This is now where the military base is. Since we did not have the 1890 census (this is the one that was destroyed) we didn’t know where the family went from there. For the longest time all we knew was that William had remarried and had a child in 1893 by his second wife. We found this in the 1900 census. We assumed correctly that Emma Leana had passed away sometime between 1880 and 1900. Finally in 2010 a very kind lady from Alexander City, Alabama took the time to walk through cemeteries in her area and record what was written on the tombstones. Her information on FindAGrave.com is how we learned that Emma Leana Scott Boland had died and was buried in Goodwater, Alabama. So yesterday I spent my time in the Goodwater, Alabama library and in the graveyard where I finally found Emma’s tombstone. There was no photo of the grave on FindAGrave.com nor was there an address for the cemetery. 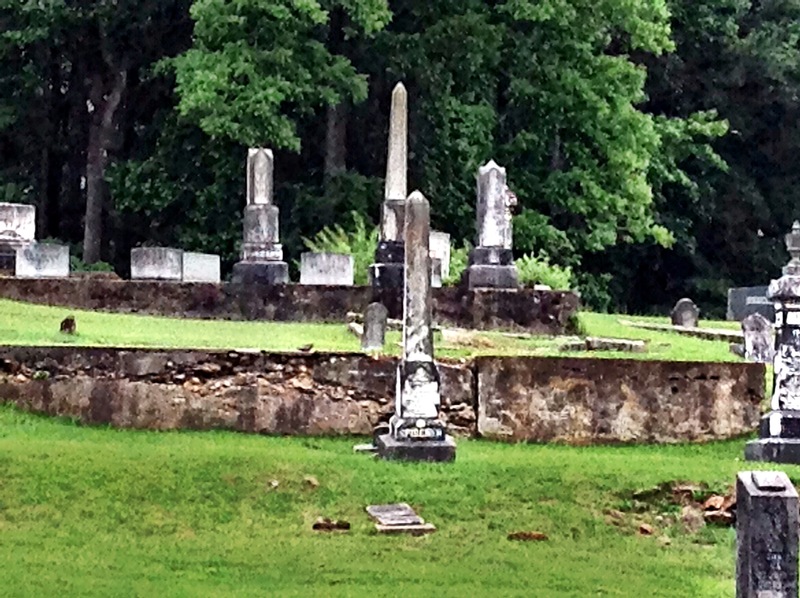 I came here to find the church, cemetery and grave; and I also came here to learn more about why they moved here and if there were any clues as to who her parents were or where in Georgia she was born. Goodwater is a railroad town in Coosa County, and I learned that the railroad came here about 1876. 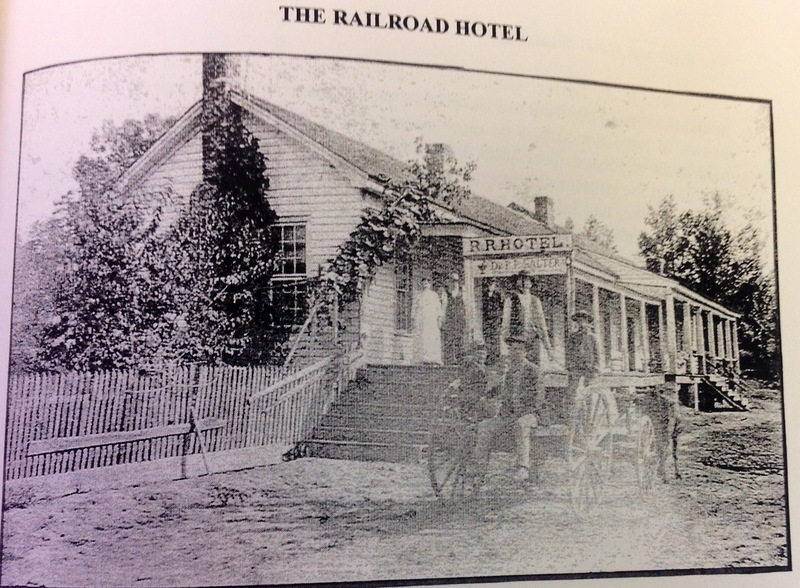 Because the town was the only Railroad stop between Columbus and Birmingham,where the railroad could refuel with coal, this town became a boom town overnight. Passengers got off the train here long enough to freshen up and have a bite to eat before moving on. I also felt certain that this was why the family moved to Goodwater. I felt the move had something to do with the railroad. Since Columbus was also a railroad city, I thought that they came here by railroad rather than by wagon. 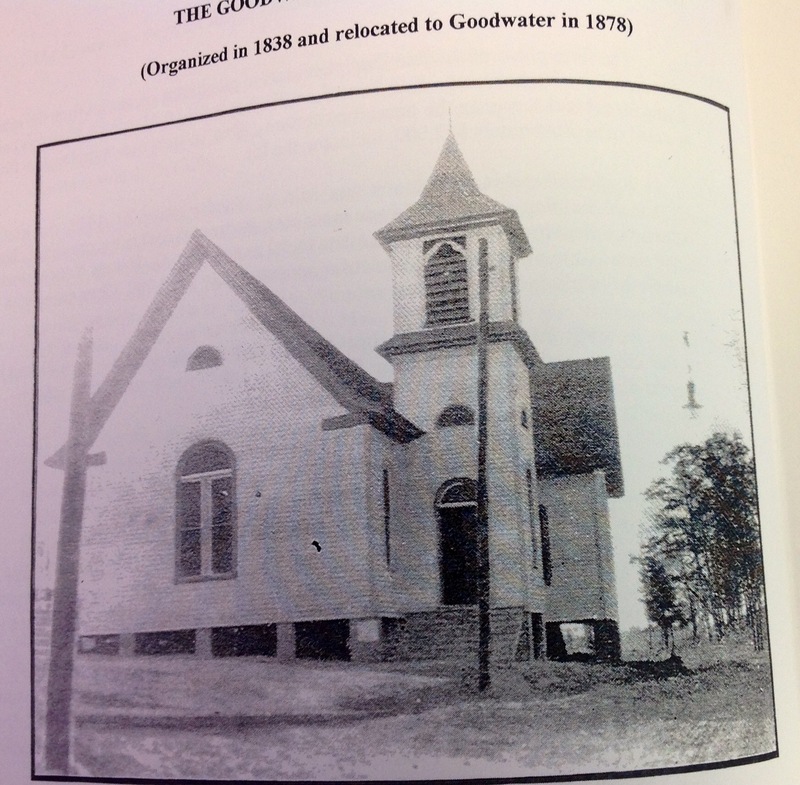 The picture below is what Goodwater looked like in the late 1800’s, when Emma Leana and William Thomas lived there. 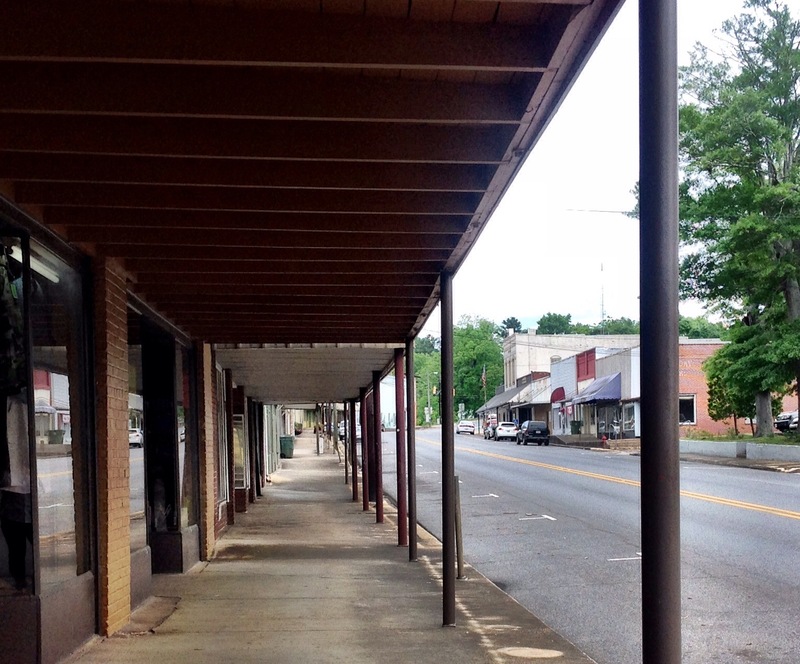 Today the old depot is a community center, the railroad hotel has been torn down, and the streets like so many tiny rural agricultural towns have a lot of businesses abandoned. I ate lunch at Meme’s Cafe, since it was the only place I found in town. What I found was a good old home-style country cooking buffet. The food was great and was even better at $6 a plate. Her spicy grilled catfish was better than Cracker Barrel’s. Below is how Goodwater looks today. Finally, it was time to find Emma Leanna’s grave. The church sits on Main Street and was easy to find It was hot, humid, and threatened to rain any minute. I found out while researching that this graveyard has over 400 graves. I expected a long afternoon, especially since shrubs covered some of the markers. 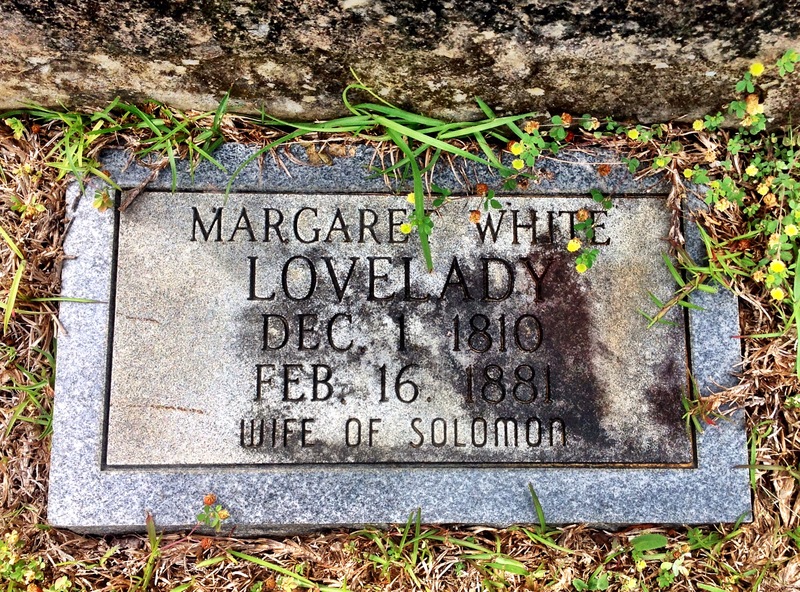 Because she was buried before 1900 I decided to look first in the oldest part of the graveyard, and I was lucky. I found her in about 30 minutes. In the picture below her grave is located on the ground in front of the nearest obelisk. I was also lucky certainly not because the grave had fallen over and broken into three pieces and the grass had almost grown over the grave stones, but because the grass had not completely covered the stones. I felt like I had to do something before I left, because in a short time the grave stones would be lost forever under the sod. Thankfully, I keep a short small shovel in the car, a trowel, and a whisk broom. I took all three and worked at digging up the stones and placing them so that they will not be lost anytime soon. When I tried to lift one of the stones, I had to push the tip of the shovel under it and raise it using my foot to apply pressure on the handle so I could get some leverage. I slipped my fingers under the stone it several inches up but could not keep my grip. The stone slammed back to the earth catching the tip of the shovel and cartwheeling it back toward me slamming its handle into my left hand. I howled and said, “Well, thank you Emma!” But this voice in my head said, “Well, don’t blame me just because you tried to use a child’s shovel for a man’s job.” I smiled, because that wasn’t Emma’s voice, it was Johnelle’s. I seem to always hear my mama’s voice when I get upset. I tried to place the stones upright, especially to get a better picture; but couldn’t. So I carefully placed them on the ground and took lots of good pictures so that I would know how to find it in the future. Chuck and I talked about it last night, and we feel that we need to come back and hire someone to repair the grave and set it back up. As far as I can tell there is no one else in the graveyard to whom she was kin. I did find lots of Scott’s while in the library. Several of the Scott family moved to this area in the 1850s. There is a chance that she and William and their children moved here because she already had family in the area. I’m just not sure, and I’ll need to do more research later. I found no other Bolands in the area. Because she is listed on the grave as Emma L Boland I believe that most people called her Emma. The graveyard is the Goodwater United Methodist Church Cemetery, and it is located right at the edge of town. I found a picture of the church that she attended which burned in the early 1900s and was replaced by the church currently standing. As you may remember her father-in-law John Wesley Boland was a Methodist minister, and I’m certain she followed the church of her husband. I noticed that all of the Scotts in Goodwater were Baptists, so that is probably why there were none buried in this church yard with her. We know that Emma and William Thomas lived here at least until 1891. While researching, I ran across this picture below. Under the photo it explained that although they didn’t know the date of the photograph, they were certain that it was taken before 1892 because one of the students in the picture became principal of the school later and graduated in 1892. He is one of the older students on the top row. There is a good chance that Emma and William’s daughter Lena Victoria is in this picture. Lena Victoria is my great grandmother. She was 15 in 1891 when her mother died. Knowing what I do about Lena Victoria Boland and Emma’s mother-in-law Elizabeth Durden Boland, I’ve noticed a three-generation long pattern. All three of these women died young and were buried and left behind. I grew up reading and watching movies about the pioneers who often times had to leave behind a lonely grave in the woods by a trail or on the prairie. It made me sad that they were left there by themselves forever with no family members beside them. Until lately, I had no idea how common this was in my own family. 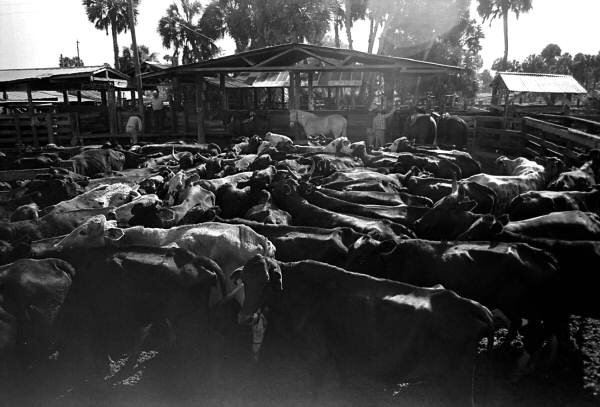 Emma’s husband William Thomas remarried, moved away, and finally passed away in Ocala, Florida where he was laid to rest beside his second wife. 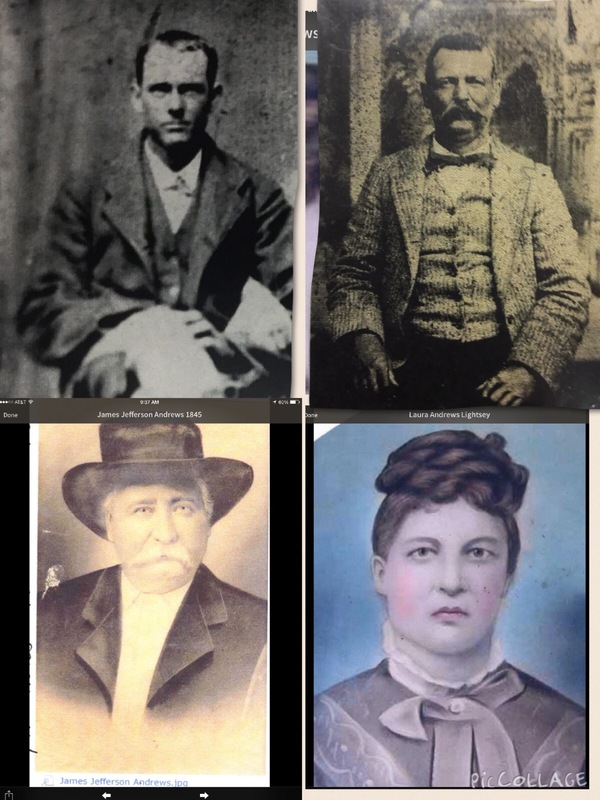 The husband of Lena Victoria Boland, my Great-Grandfather, buried her in Blountstown, Florida, remarried, and is buried beside his second wife in Winter Haven, Florida. 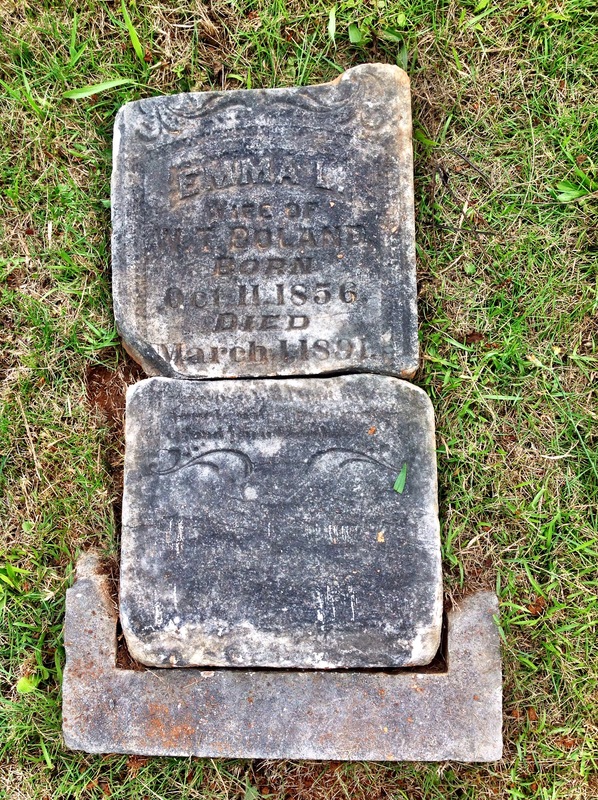 John Wesley Boland buried my great-great-great grandmother Elizabeth Durdan Boland in Cusseta Georgia, remarried, and was buried with his second wife in Ft. Benning. I’m glad I found Emma and was able to visit her grave. The next time I come, I’ll bring her flowers. Day before yesterday, I went looking for another ancestor. 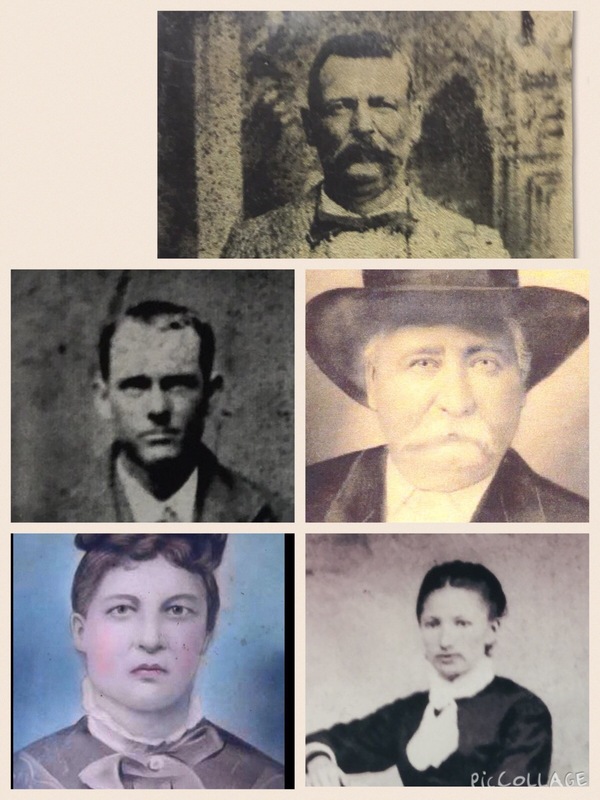 This one was John Wesley Roe’s in-laws, his wife Mary Ann Lovelady’s parents Solomon and Margaret Lovelady. 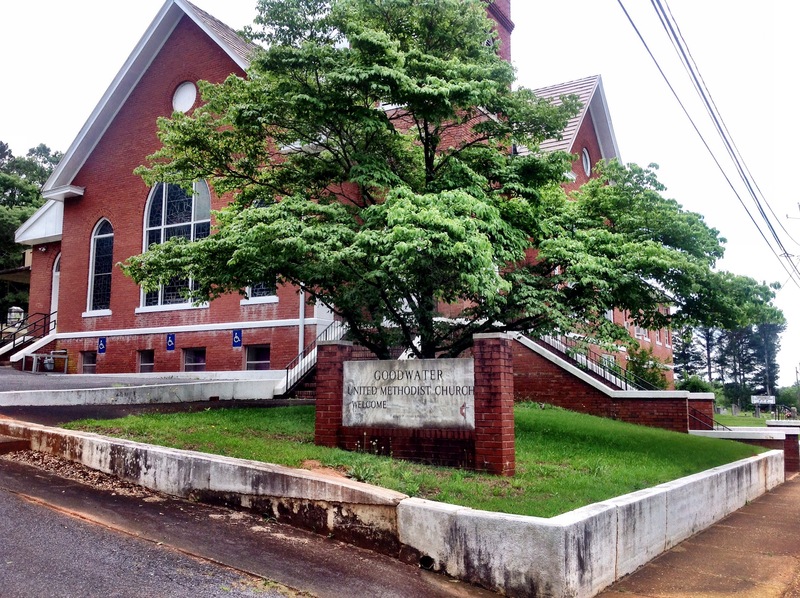 After Mary Ann married John Wesley in 1853 in Gordon County, Georgia, her parents migrated on farther west to Lynn, Alabama, which today is in Winston County northwest of Birmingham. Lynn is not the county seat, so I drove first to Double Springs to their library. I had trouble finding where to go online, but the library was easy to find as it was located out on US 278. Double Springs extended their city limits to include a village around an impoundment so I got to the city limit sign almost 2 or 3 miles before I got to the little downtown area, population less than 2,000. 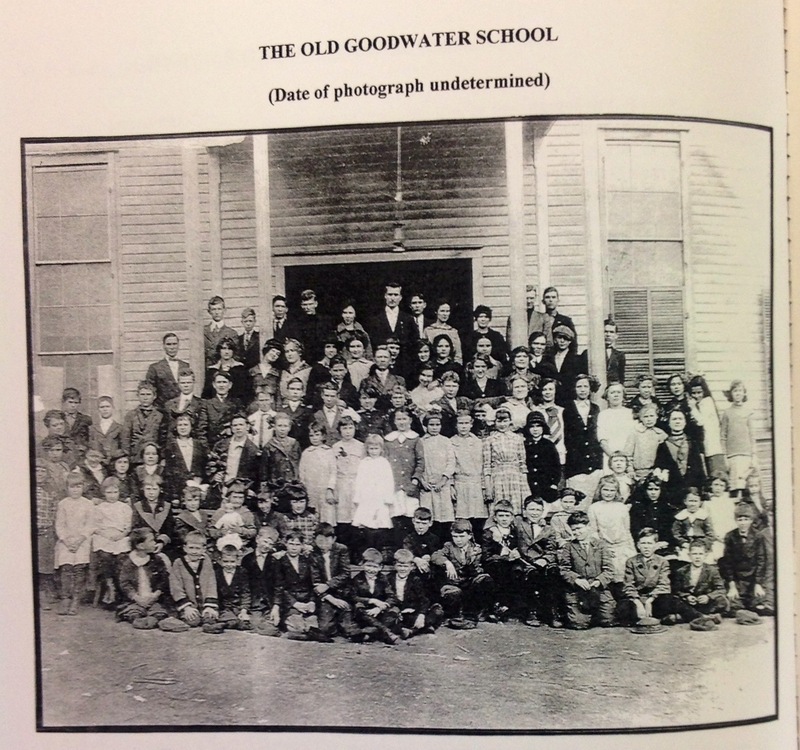 The library had a bicentennial book about the local people and their ancestors. There were several stories about Solomon and Margaret’s children but not such about the generation before, except one which I’ll describe later. By the way if your ancestors were some of the first to an area or if their offspring stayed there, look for anything written in the area during our nation’s centennial and bicentennial celebrations. It will amaze you what you’ll find. 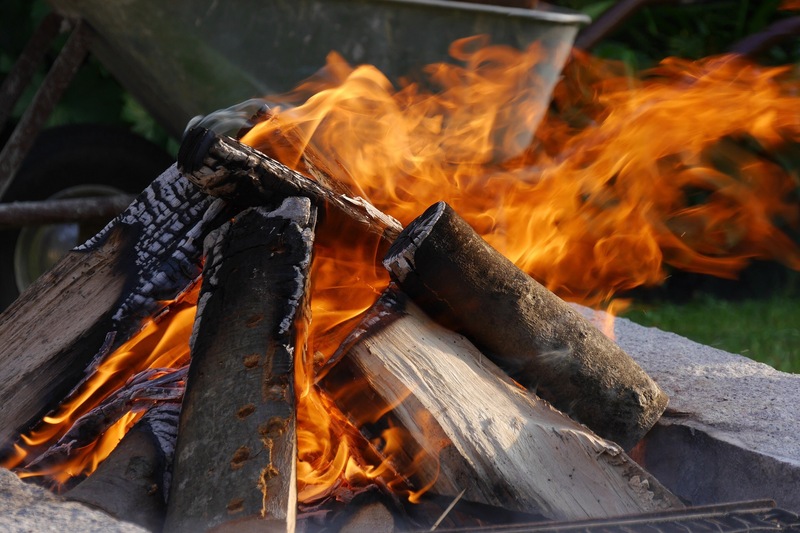 It will mostly be stories passed down, but these can be important clues for what and where to look for more definitive research. 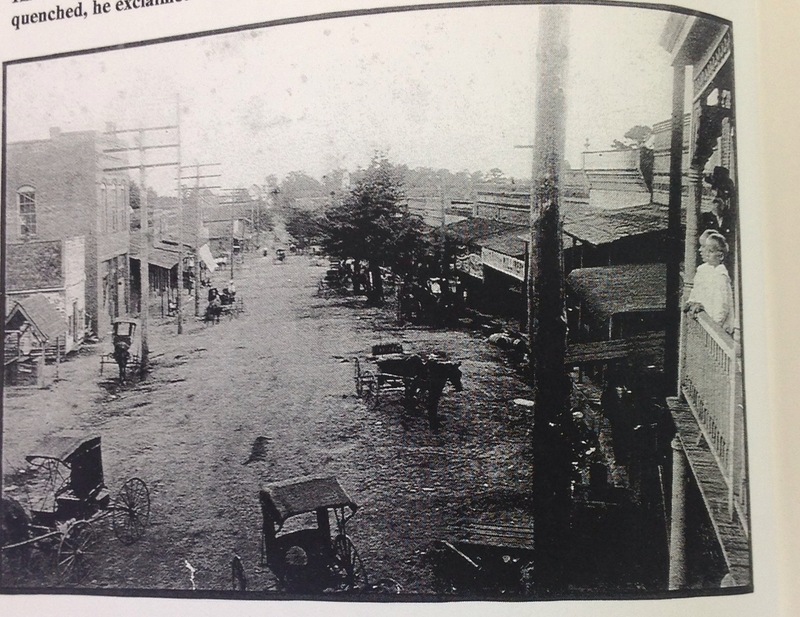 Anything written during the centennial was written in 1876 so it could be first-hand information if the area was settled in the early 1800s. The library also had about 20 copies of the local geneaological society’s newsletter which had lots of stories about local settlers, but it was not indexed. I did glean some info using the table of contents in each, but I’m sure I missed some. The evening before I had found a location for a grave on a road called the Yankee Trace Road, and I did run across a story about how the road got its name. I’ll explain later. After the library, the librarian suggested I stop by their local archives. I had found nothing about this online; so I made a stop there, which was directly across the street from the courthouse. Along with more information, the archives lady gave me a very good county map showing where Sardis #1 Baptist Church is located. I lit out and drove straight to the grave of Margaret Whitthus Roe, my fourth great grandmother, who is buried at Sardis Baptist Church on the Yankee Trace Road. Let me tell you about this road and the countryside through which it runs. 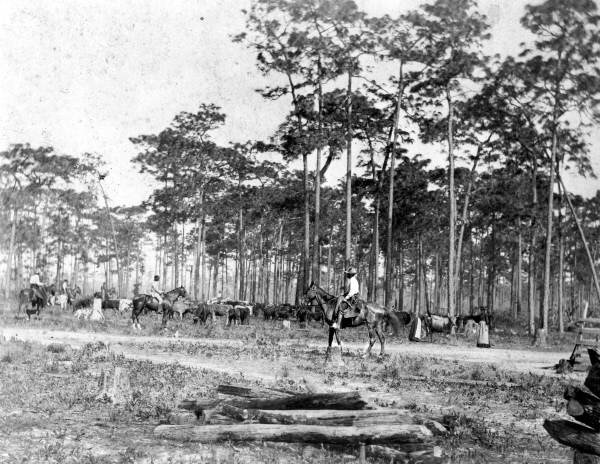 The road is named Yankee Trace because it was one of the routes taken by a portion of General James Harrison Wilson’s Union Calvary, when it was on its way to the Battle of Selma where later Lt. General Nathan Bedford Forrest was outmanned, outgunned, and defeated. 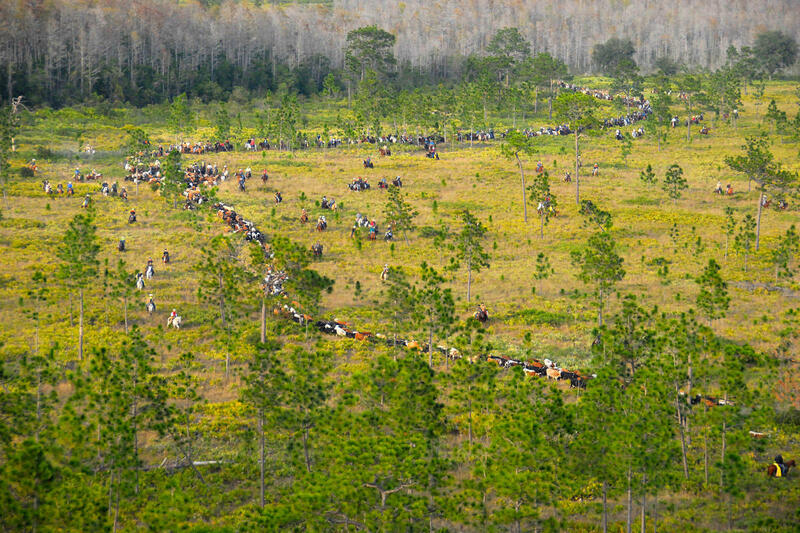 This Calvary battle was fought in March 1865 and is known as Wilson’s Ride famous for being commanded by one of the youngest generals in history. It is also known as one of the largest Calvary assemblies in history if not the largest. I guess that is what it took to finally defeat the Wizard of the Saddle. I wonder where the family was when this group of men rode down this road. 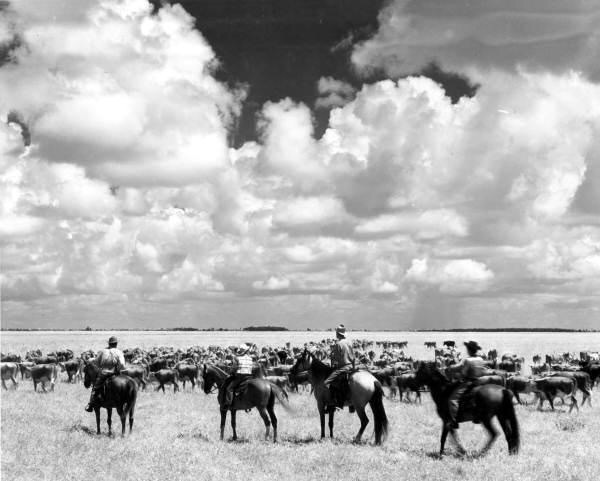 I also wonder if their foraging units made it to the Lovelady homestead which I believe was a little over three miles away. The countryside here is very pretty. This is Alabama hill country, and the hills are not small hills. The road sides are especially beautiful this time of year with Queen Anne’s Lace growing wild. As cars pass, the wildflowers roll in the wakes made by the wind. 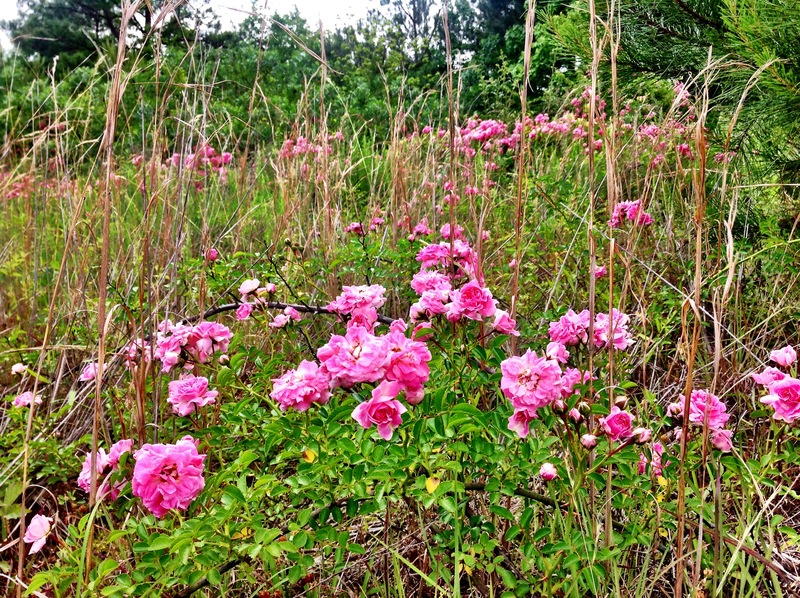 I kept noticing pink roses growing wild in the woods, until I finally stopped and took a picture. I think it is a wild climbing rose. 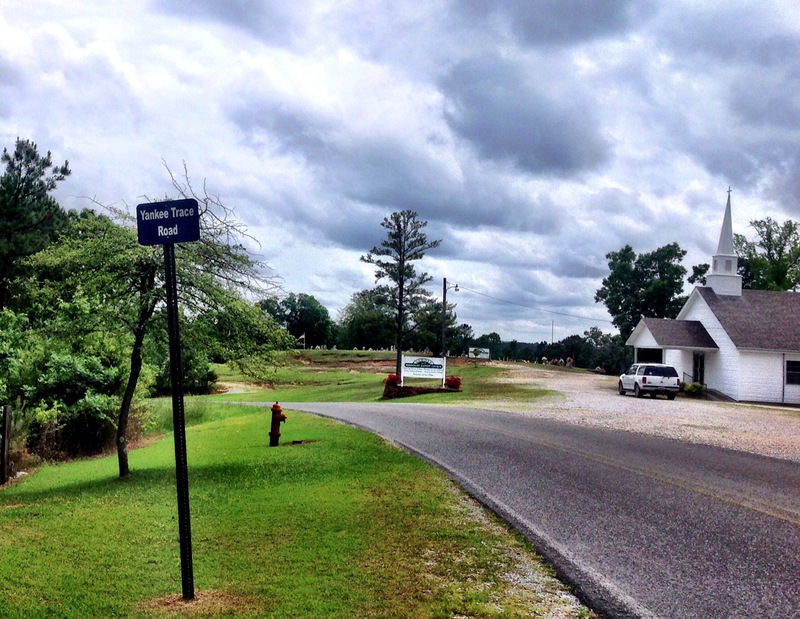 The Sardis #1 Baptist Cemetery is located on US 17 which is also known as the Yankee Trace Road. The cemetery sits high on a hill next to the church which has sweeping views of the countryside below. The road curls around the cemetery. I wondered how loud the Union Calvary was when it passed here in 1865. I quickly found Margaret’s grave and took a picture. Then I just took a moment to stand and gaze at the views from high atop this hill. What a beautiful place to go to rest. It appears that sometime between her marriage and this grave, her name was changed from Whitthus to White. The marriage record shows her maiden name as Whitthus. Someone had placed a newer marker at the base of the older one with the basic information that was on the older stone. I found no grave for Solomon, which brings me to the story found in their bicentennial book. It said that according to family tradition Solomon became ill and died while he was with a son who was moving to Tennessee. They said he is buried in Wayne County, Tennessee. So let me try to put this into perspective. If he died on this trip then it had to be after 1880 where I found him in the Winston County census. He was 79 and his wife was 59. I think I must have good genes because this man made that trip over the age of 80 when there was no interstate and when the only way to travel was by either horseback or wagon. He must have thought he was healthy enough for the trip. Wayne, Tennessee is 120 miles north of Lynn, Alabama. At about 20 miles a day it took them at least six days to make the journey. Since Margaret died in 1881 at the age of 60 (I’m glad I have Solomon’s genes, too), I’m wondering if he moved because she was gone and there was less of a reason to stay. I also found a possible homestead area. 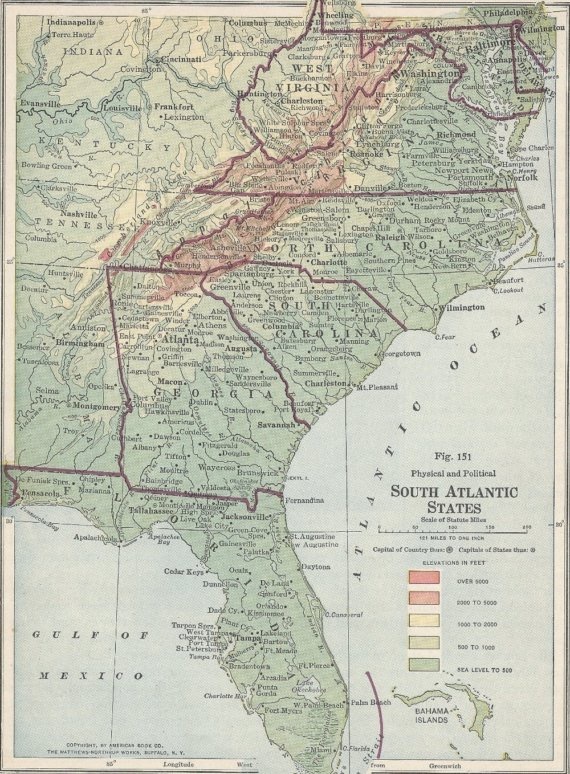 Some archive maps showed where some of the earliest settlers lived. 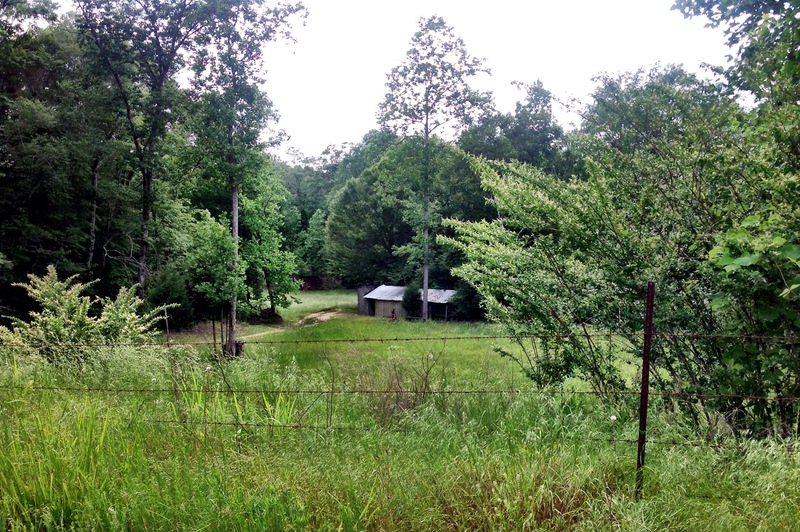 There were three Lovelady homesteads in the names of three of his sons. I felt certain that one of those was Solomon and Margaret’s original homestead. One of the homesteads I drove to was over 8 miles away actually closer to 10, and I felt certain this was not where Solomon and Margaret lived. Another one that I didn’t drive to was all the way on the other side of the county which was even farther away. The one I think that they lived in was only 3.5 miles away from Sardis. I drove to this land using the county map and a copy of the county plat map showing where the Lovelady land was. I took some pictures of where I believed it to be. It was an educated guess at best. 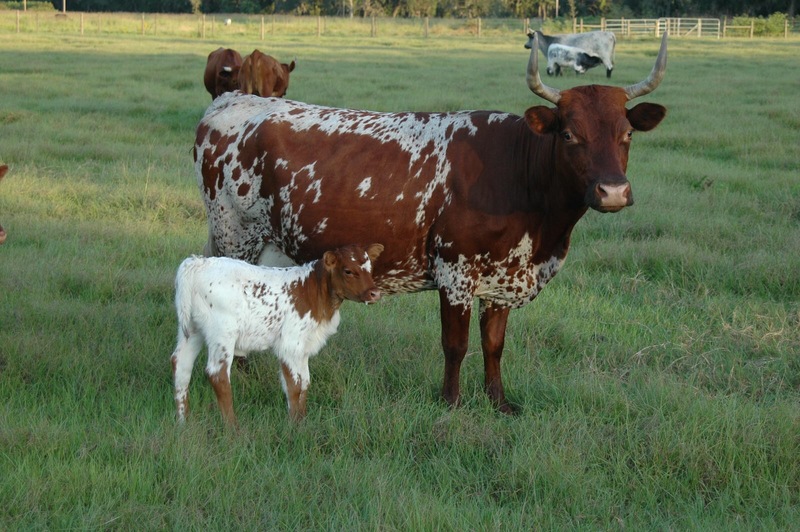 I have been in touch with a Lovelady cousin who may have better information. He is who posted Margaret’s grave on Find A Grave. It is a beautiful area with a creek running through the bottom. 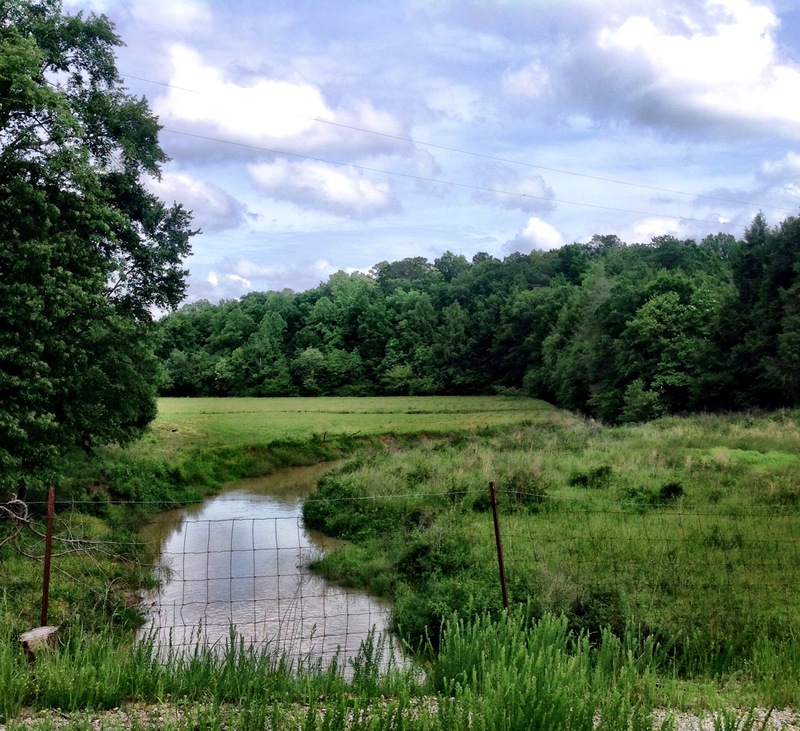 It looked like bottomland around the creek, and today it is in pasture. it was probably a good place to raise crops. We have had a lot of rain lately, so the creek was muddy. I traveled the two lane road and later gravel road which ran between the church and where they lived. How exciting it must have been for the entire family to go to church and have dinner on the grounds, something that was not done weekly. It was usually an all day affair and one of the few times that the family got to visit with others in their community. Their homestead was way out in the country, and the little road ran high over hills and down into the deep draws crossing little creeks at natural fords. Today it is a little canopy road in places. It must’ve been as beautiful back then as I found it today. Finally, thanks to one of the books, I think I know how they got here. The original trail into this area was known as the High Town Indian Path. It ran from old Charles Town on the Atlantic Ocean to the Chickasaw Bluffs which today is Memphis, Tennessee. It was a trading path used by the Indians and later by the European explorers, trappers, and traders. It followed a divide, a ridge, where water falling north of it ran into the Tennessee River while water falling south ran toward the Gulf of Mexico at Mobile. 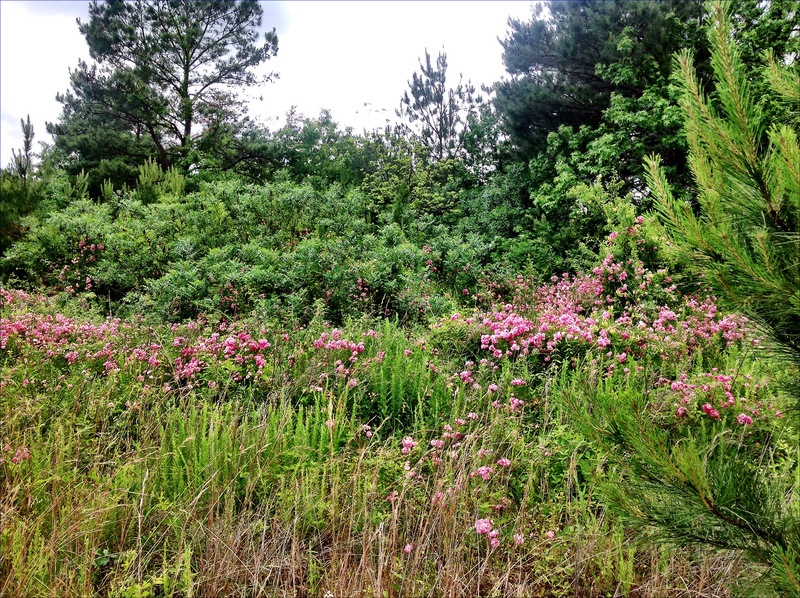 The same trail crossed North Georgia close to where the family lived before they migrated west to Alabama. This trail later became a wagon road. Today, one can still hike parts of this trail in the Bankhead National Forest in Winston County. It is said that Davy Crockett used this trail during the Creek Indian War of 1812. The halfway point on the trail was the Indian village called High Town near current day Rome, Georgia.